Note – this is now Chapter 10 of the story Of Wind and Wings, a story inspired by these prompts of Sue’s. The walk was exceedingly uncomfortable. Ed did stop himself before saying just how uncomfortable out loud, but he couldn’t stop from mumbling. The mumble was made worse, since it was part of catching himself after being tripped by an unseen obstacle. His feet were getting a bit sore, made worse by the fact that his shoes had been soaked by stepping on some marshy ground. It looked solid enough and his companion, Lauren, didn’t sink in at all. Currently she was his biggest source of discomfort. “… I would have loved to have seen your face as you hugged ‘the other woman’ when they were leaving after your fiftieth birthday party. The other woman! How much I love saying that when she is the wife’s girlfriend, not the husband’s. You don’t find it awkward that I’m going on like this, do you? I know that my sense of humor is, shall we say peculiar? Perhaps that’s the reason why I am still Miss Smyth and not Mrs. Somethingoranother.” She laughed. If he didn’t feel so self-conscious, Ed might have thought the laugh rather pleasant. At least as such things as laughs went. There were times Ed found Lauren’s mode of expression slightly confusing. Confusing was actually a harsh term, but Ed sometimes felt he talked he was muddling through the words while she danced. “Yes, we shall move from your fiftieth to my fortieth. It wasn’t a party, mind you, just a celebration amongst friends. If you can call them that. Friends.” She laughed again, a sound that sent a spark up Ed’s spine. Ed nodded, but taking his attention away from the land made him miss the next little hole and he half tripped again. Was his mental map of the moor from the night before just another dream? Ed recalled that Liza occasionally prattled on. Perhaps it was genetic. He cursed himself for thinking such judgmental thoughts. He did whimper and whine about his birthday party for a half an hour, didn’t he? Ed wasn’t sure if he were more or less embarrassed when Lauren talked about herself than when she was teasing him. Ed decided that he was more embarrassed when she was talking about herself. Much more embarrassed. So, so much more embarrassed. He hit another hole and fell all of the way down. Ed took her hand. Their eyes met for an electric instant, but she turned as soon as he was up. She walked a couple of paces away. She turned to face Ed. He was surprised to discover that she was on the verge of tears. She swiveled and headed off in a slightly different direction than before. They had left the marshy swamp area behind, but now they were going up to a rougher, higher ground. They walked in silence, each lost in their own thoughts. As he watched the woman ahead of him, Ed was no longer certain that she was the woman of his dreams. She was all too flesh and blood. And it wasn’t as if she had all of the answers. No. She had as many, if not more, questions than Ed. Yet he really did feel a connection. A light raise in heartrate when she looked at him. A pleasure when she spoke, even if her actual words embarrassed him. Embarrassed. Ed felt his face heat up again. Though to be completely honest, it wasn’t her fault. It was Ed who had felt so comfortable with this almost stranger that he opened the deepest recesses of his mind to her, exposing all of his insecurities for her examination. That she gently teased him in return before opening up herself and sharing her own insecurities should not have surprised him. Ed took an exaggerated step over a hidden rock. Hidden, but he knew it was there, just waiting to bump an unsuspecting shin or stub an already bruised toe. Without thinking he closed his eyes and continued to follow Lauren. He couldn’t see her, but he could feel her, like a bright fire on a cold night. He also couldn’t see the land under his feet, but he could feel it. He knew its shape. The sense of the moor was returning. We walked on up the rough land, slowly climbing, without slipping, tripping or falling. Without peeking once. The warm shape in front of him stopped. They were on a rise with a few bent and gnarled trees partially blocking the view. Beyond those trees he could make out the sparkling effects of light on water spread out hither and yon across what had seemed dry ground when walking across it. Various small showers and stray sunbeams competed for attention across the wild open area, making the distant hill seem even farther away than it really was. How a few feet could so change climate and landscape, yet being on that plane it felt as if every inch was exactly the same as every other inch! Edward both marveled at it as if discovering a new world and had that peaceful feeling of returning home after a long, difficult day. “Isn’t it beautiful?” The tears trying to free themselves from Lauren’s eyes at last broke free. She looked at him and smiled. Ed realized he had tears in his own eyes. “Yes, it is,” he said. He discovered that her hand was in his. No longer facing each other, and still lost in their own thoughts, the two still held hands as they watched out over the land. A sudden thought hit Ed. A rain squall passed over. Ed closed his eyes against the stinging drops. They were gone in a minute, but he left his eyes closed. He could feel the land stretch out beneath him. He could mark every place on it, knew where life existed and where stone began. He could feel the woman next to him. Ed opened his eyes and looked at Lauren, who had spoken. Her eyes stayed shut, yet she seemed to be looking out over the moors. Her face was serene as she spoke, a calm beauty that answered the stark wilderness around her. She smiled, though Ed thought it a sad expression rather than happy. The wind grew, billowing clouds out into giant wings behind Lauren as Ed watched. A gust blew her hair. She used her free hand to move a strand from in front of her eyes. She then opened them and turned to him. He was caught by her magnate, their eyes locking. The kiss was enviable, destined, Ed thought, yet took them both by surprise. It didn’t last long, yet it lingered forever. When it broke, Lauren smiled up at Ed. “Come, we need to get back.” She pointed in an odd direction. “Wouldn’t it be quicker to go that way?” Ed pointed towards where he felt the house must be. Before Ed could answer, she dropped his hand and started walking in her direction. She has half laughing, half singing a song as complex as any Schoenberg could have created yet as beautiful as Paul McCartney at his best. Ed could only shrug and follow, half humming a counter melody, equally as complex and beautiful as Lauren’s own. As they went lower, they could hear the wind whistling through the twisted trees up on the ridgetop in answer to their song. The screech carried a stark, empty feeling, one that was only filled when Ed watched Lauren as she broke the path in front of them, their combined song creating a universe out of the void. She was right, Ed decided, why hurry? And so it continues, now up to chapter ten (10) of the newly named Of Wind and Wings. Chapter 9 is here. Chapter 8 is here. Chapter 7 is here. Chapter 6 is here. Chapter 5 is here. Chapter 4 is here. Chapter 3 is here. Chapter 2 is here and Chapter 1 here. This entry was posted in Fiction and tagged contemparary fantasy, contemporary fantasy, fantasy, serialized book, serialized story, speculative fiction on November 1, 2018 by trentpmcd. 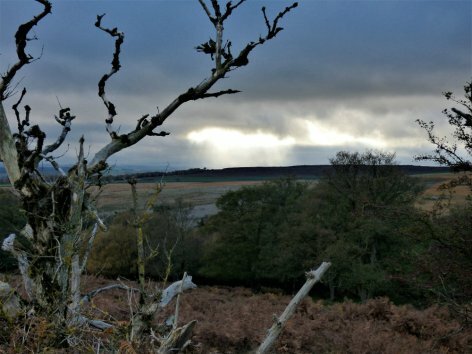 You are right, Trent… there is a stark beauty on the moors… and in the nked human heart. So it would seem.. in both cases. I ended up adding a non-#writephoto chapter. When I do the challenge I want to have as open of a mind as possible, so if I have an idea that must be said…. So I put up a new chapter.